My favorite vegan mac and cheese! The easy, creamy sauce is seasoned with smoked paprika and Dijon, which give it an irresistible depth of flavor. I’m not going to lie and tell you that no one will believe this vegan mac and cheese doesn’t have cheese. 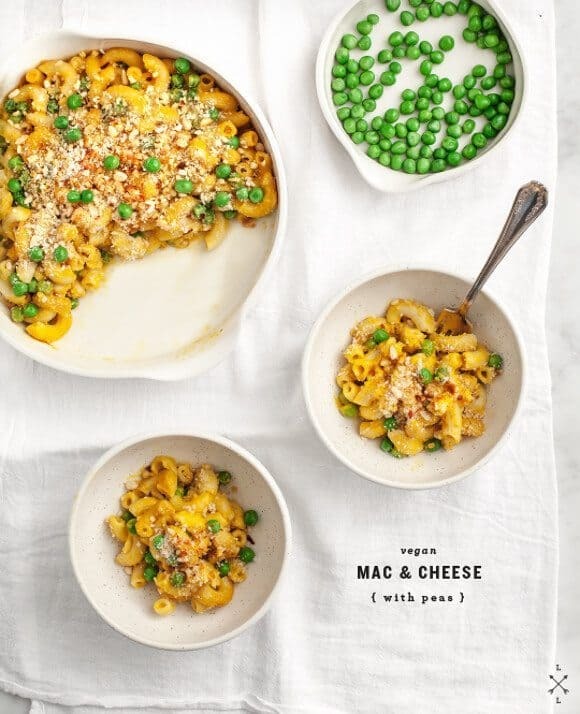 If you’re vegan, this mac will taste darn cheesy… if you are a true cheese lover (as my husband Jack is), you won’t be totally fooled, but you will devour it anyway. Jack likes to make fun of me when I make things like this. He calls it “mac & sauce” and “vegan velveeta,” but in the end he always eats his words. And most of the food on the table. Coconut milk is the creamy base of the sauce. Nutritional yeast is the secret to getting “cheesy” flavor without any real cheese! It’s also loaded with B-vitamins and has a bright yellow color, which makes this look like a classic mac and cheese. Tomato paste adds a layer of savory flavor. Dijon mustard contributes a tangy kick. Smoked paprika is the star ingredient. It adds a smoky depth of flavor not only to the creamy sauce, but to the crispy baked topping as well. This recipe is really simple. First, sauté the onion in vegan butter, and add flour to thicken. Then, stir in garlic and lemon juice for extra tang, add the remaining sauce ingredients, and let it simmer away! While the sauce is simmering, cook your pasta. When it’s cooked, stir together the pasta, some of the sauce, and peas for a pop of green! You can serve the pasta at this stage, or you can make this a baked mac and cheese. 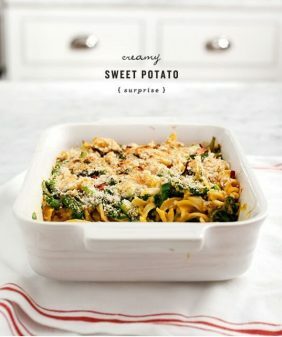 If you’re baking the pasta (which I highly recommend – I love the crunch of the crispy, spicy topping! ), preheat your oven and transfer the noodles to a baking dish. Make sure the noodles are nice and saucy at this stage, because they will dry out a little in the oven. Sprinkle your mac and cheese with the panko topping and bake until it’s lightly browned. 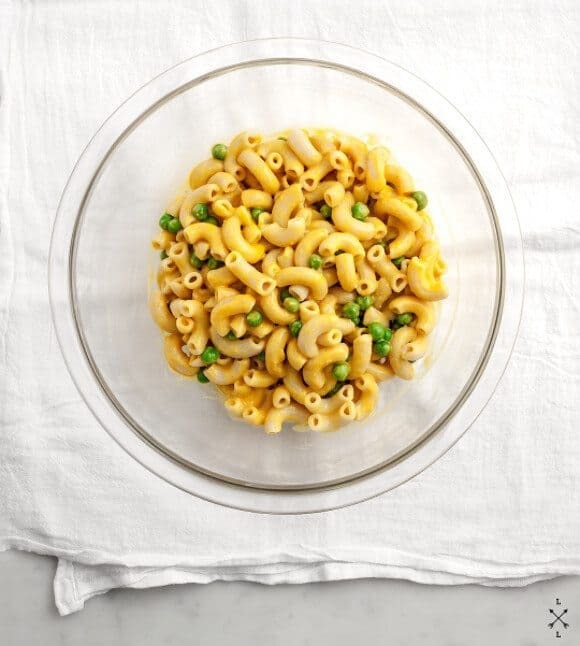 Finally, serve your vegan mac and cheese with extra sauce on the side, and dig in! Don't skip the smoked paprika in this vegan mac and cheese - it adds wonderful depth of flavor to the sauce. It's also in the yummy crispy topping, which makes this dish full of satisfying creamy/crunchy texture. Heat the butter in a medium pot over medium heat. Add the onions, a few pinches of salt, and simmer until translucent (about 5 minutes). Next, add the flour and whisk to thicken. Add the garlic and cook for a few more minutes on medium-low. Squeeze in a good amount of lemon juice and stir to make sure nothing is sticking to the bottom of the pan. Add the coconut milk, nutritional yeast, mustard, tomato paste, turmeric, paprika, and a few more pinches of salt. Let simmer, stirring occasionally, for about 15 minutes. Meanwhile, cook your pasta. Optional step - transfer the sauce to a blender and blend to make it really creamy. Taste and adjust seasonings. In a large bowl, stir together the cooked pasta, some of the sauce, and the peas. Stir in pasta water as needed to thin the sauce. You can stop here and serve this now if you like, or continue on to bake it. Preheat the oven to 450 degrees. Place everything in a baking dish, add more pasta water and possibly more sauce. This will dry out a little while baking so make sure it's really creamy first. Add the breadcrumbs, panko, a little more salt, cayenne, and paprika on top. Drizzle with a little bit of olive oil and bake for 8-10 minutes, just until the crust starts to become golden brown. Serve with extra sauce. I do love some vegan mac ‘n cheese! This version looks fantastic! Ahh. Love me some vegan mac n’ cheese! Smoked paprika is a constant addition in mine, but I have yet to try coconut milk. The peas are perfect. Looks like I know what I’m making tonight! This looks AMAZING! I am going to make a gluten-free version of this for dinner next week. Do you use full fat coconut milk from a can or unflavored coconut milk from a carton? I used full fat coconut milk from a can… mine was close to being gluten free (I used brown rice pasta) so it’s totally possible… use a gluten free flour & gluten free bread crumbs and you should be good to go. Thanks so much Jeanine! Headed to the grocery store in just a little bit to grab what I need. Have a great weekend! I’m looking forward to trying this. I finally got my hands on some nutritional yeast and have been searching for a really good first recipe to test it out on my husband. – he might be a tough sell, but this has a pretty good chance of winning him over! This looks great! Yet another comfort food you don’t have to miss out on as a vegan. I am totally down with vegan velveeta. It’s gotta be better for me than the original. Tell Jack he’s an intuitive man. I AM a “true cheese lover” myself…but regular mac ‘n’ cheese is just too much for me to eat regularly, so I can’t wait to try this myself. It looks DELICIOUS. Coconut milk is a great idea to add that rich, creaminess that mac & cheese demands. Coconut milk! How interesting. 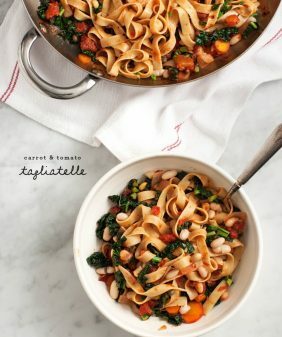 I guess this would be a good way to play around with other vegan “cheesy” pastas, too. I make something almost exactly the same! I’ve since even taught my husband how to make it for himself! Although, he usually tops it with a little extra cheese before going into the oven, ha! I made this last night. Very tasty! I recommend using the two full cups of pasta water (maybe a bit more). I did and it turned out nice and creamy (not dry). Thanks for sharing! Thank you, thank you for posting this recipe! I’m trying to eat less dairy because no matter how much I love cheese, it doesn’t always love me back. Mac and cheese is one of my favorite foods, so I look forward to trying this. This was so tasty – thanks for the recipe! I often find the vegan mac & ‘cheese’ recipes that call for sweet potato/squash are too starchy for my liking, so this version was fantastic. Instead of the peas (my man hates peas) I tossed in both sundried tomatoes and little plum tomatoes. This version of vegan mac n cheese sounds perfect. I cannot wait to try it! I experienced my first vegan mac and cheese at a local restaurant the other day (and liked it), but your version looks even better! Though I do love cheese, I don’t often indulge in super creamy, cheesy things, and this looks like a satisfying yet less indulgent option. Hope to give this a try before winter is over! I’m wondering why you don’t use vegan cheese? You could if you wanted. I tend to eat it only occasionally because it’s very processed and doesn’t have much nutritional value. (I’ll eat it on a grilled cheese now and then). For this recipe, I was just playing around with an alternative and I had some coconut milk that I needed to use up. Another great creamy alternative is cashew cheese… and another is a pureed sweet potato sauce (I linked to in the post above). Great recipe!!! But is this coconut milk from a can or carton??? Thanks so much!!! And I just wanted to say that I love reading your blog! The layout is so perfect, and each picture is a work of art!! : D I find myself coming back to view your posts (even though i looked at all the recipes!) because it’s so pretty and I love the recipes and photos!!!!! 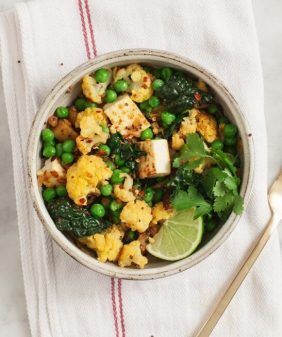 This is for tomorrow night’s dinner, can’t wait to try it… I have all the ingredients at hand, so I’m sure it will be a satisfying meal for my hubby…. For the nutritional yeast…is it the flakes or the seasoning. What is the nutritional yeast supposed to do in the recipe? I went to the store and it was almost $40. Then there was the powder for $15. Just trying to figure it out. The nutritional yeast has sort of a cheesy flavor that’s necessary in this particular recipe. It’s entirely different than the yeast you bake with. $40 is high, I buy mine (the flakes) in the bulk bins at whole foods. I buy maybe a cup or so at a time and it’s just a few dollars. A whole tsp was waaaay too much paprika for me- I’d recommend taking it down to 1/2 tsp or even 1/4! thanks, I’ll update the recipe suggesting to starting with less and adding more if necessary, to taste. Sometimes dry spices can also vary in potency. Hi There I have a family of 5 is this recipe enough for a full serving for each member??? It might depend on the ages of your children (how much they eat), but to me this seemed to serve about 3 good meal-sized helpings. I’m pretty sure I had extra sauce, so you might just want to scale up the amount of pasta you use. Just made this mac & cheese. I stopped just before baking as I made it for a 5 year old who doesn’t care about that part. I only made slight changes/substitutions due to what was on hand and it came out very cheesy and covers quinoa elbow noodles very well. This is a very tasty version, and I thank you for posting it. He loved it and told me more than once! I just made this and it was delicious! I used chopped kale instead of the peas, and next time I might double the amount of nutritional yeast (I like it cheezy!). 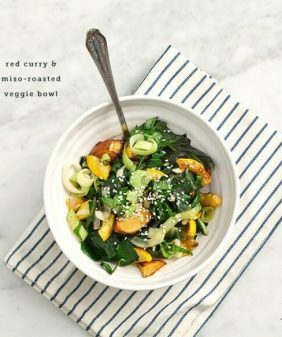 Thank you for this recipe – even my non vegan friends liked it! Can I leave out the tomato paste? Can I use regular mustard? 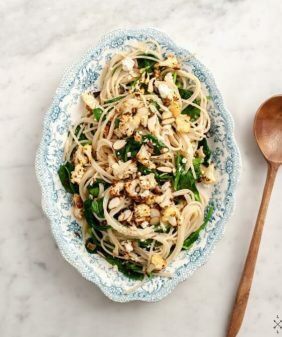 Hi this looks so yummy and I love coconut milk, but not sure I’d like It in a pasta dish. Could I substitute It with another non dairy milk such as rice milk? I just tried this (with almond milk because we only had sweetened, vanilla coconut milk) and thought it was amazing! My husband and I have very different taste in foods and it’s hard to find something that I can eat with all my food allergies and that we both actually like. This is definitely a winner on both of those accounts. Thank you, thank you, thank you! Tried this, it was delish. I used lime juice instead of lemon and omitted the tomato paste and paprika (didnt have those ingredients on hand) and I used coconut cream instead of milk. Overall, delicious!! I’m transitioning to a plant-based diet – and the one thing holding me back is cheese. I love cheese – not often or in large quantities – but I do love cheese. 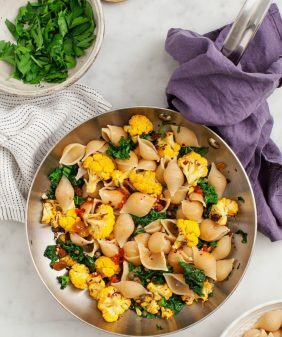 Thanks for sharing this recipe…I’ve been wanting to try a vegan mac & cheese and this version will be my gateway! I’ve been seeing a lot of cheese recipes that use coconut milk. Do u mind if I ask does the cheese have a coconut taste? Thanks! I just made this recipe and I LOVE how it came out! The paprika gives it almost a bacon-y flavor. Bringing it to an omnivore potluck tonight, with pride! Thanks! I’m so glad you liked it (I always say smoked paprika is like vegetarian bacon :)). Thanks for the suggestion, let me think about a way we can make the comments more helpful. This is the second time I am making this…thanks so much for the recipe! I added a bunch of veggies to mine…spinach, carrots, broccoli and soyrizo inspired by the Homeroom Mac and cheese and what they have as add ons. Hi! Can I make this ahead? Like assemble it and bake it later? I am looking for something I can make part of the way (earlier in the day) and finish it off in the evening for dinner. Can I do this with this recipe or should I find something else?